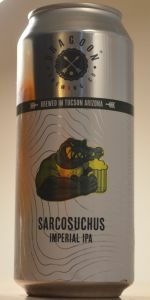 Home Beers Dragoon Brewing Co.
Sarcosuchus Double IPA | Dragoon Brewing Co. Picked up a 16 oz single from King's Beer & Wine 5-25-18 for $4.49. No canning date but it was newly released at time of purchase. Cold stored since purchase. Beer poured orange with a very nice white head that is leaving some lacing behind. Nose is earthy and floral along with some grapefruit. Malt base is sweet. Taste is a huge sweet honey malt base that combines quite nicely with the floral and grapefruit hops. Finish is classic old school west coast DIPA bitterness that is the eqalizer and then some to the malts. Overall this is a very good DIPA. It reminds me very much of Hop Slam with the honey but definitely a hoppier brew. Would definitely do again! 10 oz. pour. Medium copper/orange color with thin off-white foam. Nice floral/citrus hop bouquet in the nose, but hard to get a good whiff from this small glass. The beer tastes very spot on for what the style should achieve. The hop intensity is superb with plenty of citrus fruit and touches of pineapple. The malt character is clean and carefully balanced. It's definitely a big beer and warming, but the hops shine through and stay the focal point. The finish has a strong bitterness. If you've tried the regular Dragoon IPA it doesn't deviate much from that hop character, it really is just like a double version of it. The alcohol itself doesn't taste too overpowering, but it's still a slow sipper, at least until you finish one glass, and at that point it becomes dangerously drinkable. While anticipating the release of this beer, I was hoping for something a little more unique. It wasn't that so much, but it is a damn fine IIPA and well crafted. Just as Dragoon IPA is the best IPA I've tasted from an Arizona brewery, I'm sure this is the finest Double IPA. One of the most important aspects of such a big beer is to maintain a good balance and the Sarcosuchus does it nicely. I'm definitely going to drink more of this while it's available. 10 oz pour in a small tulip. I'm told it was named after an ancient crocodile as a result of a drunken bar conversation. Perfectly clear goldenrod color, thin ring of bubbly white head. Smells amazing, like one of my top five good smelling beers. Like fresh Sculpin from three years ago good. Big, vibrant bitter orange, lemon zest, mango, pineapple, some dried pine needles. A little spicy. Just a touch of dankness. I want to dab it on my collarbone and hit on your mom. Wow. Big, boozy hoppiness. Pine sap, dankness, juicy blood orange, grapefruit zest. The alcohol shows up lending some astringency, but it compliments/is covered up by the hop bitterness and flavor fairly well. Pretty dry but with enough honey-ish malt to balance it. Finishes surprisingly gracefully and clean for it's ABV/bitterness, with some brief piney dank before a clean end. Lightish side of a medium body, well attenuated. Ends just a little sticky, but way less so than DIPAS of comparable ABV's. Overall a tasty bruiser of a DIPA. I'd put this guy against Heady Topper or Palate Wrecker any day. It could do with being a little less boozy/astringent, but it's a minor flaw for a high alcohol DIPA. Dragoon loves them some hoppy beers and this one is well executed. This is a perfect IPA, what else can I tell you about it except it doesn't travel out of town and so you probably ain't gonna get any,.... sorry - If you are in the neighborhood, it is only in a few places outside of the brewery and won't be around long so do not pass this up. This IPA is one of a few perfect 5's I have ever given a beer. In the glass, it's a liquid of outstanding clarity. Rarely have I seen filtered water this translucent. Colored the bright gold of a piece of bullion, topped with a head of snowy white froth that evaporates after a short time. Floral honey. Grass blades. At once sweet and resinous, a juicy hop. If you smushed a hop with a juicer, I'd imagine it would produce this aroma. Lemon-lime. Citrus peel is moderate. Some stone fruit sweetness -- honeydew! Smells like brunch. Blueberry, pear, green grape, vodka, wet grass, grapefruit pith, sticky icky. A very berry-fruit hop character punctuated by ethanol -- reminds of the blueberry vodka I that gave me so many hangovers as a young'n. Bitterness is pretty mild for a beer of this much hop character, as is sweetness. So many double IPAs tend to lean way too far one way or another: Sarcosuchus has found a realm that can support his heft. The flavor of alcohol is just a bit too pronounced for me, but it's balanced out by a dry, Chardonnay-like character that becomes even more pronounced as the beer warms. Yellow sour patch kids. Body is sugary, just medium-light but viscous. Alcohol numbs the tongue and adds peppery heat. Carbonation is mild, tingly. Brilliant. Despite the alcohol flavor, it's still deceptively easy to drink -- you don't know how much trouble you're in until you stand up. What makes it great is its clean, clear flavor. The melon and grape notes -- derived entirely from the hops -- are likewise reasons to keep coming back. Out of a Crowler fresh from the tap. Good color and head. Taste was extremely pleasant for a high abv dipa. Complex mix of flavors all well balanced. Get it as I think I heard it will be limited. Thanks for the recommendation, Mark. On tap at Boulder on Broadway. Poured pale golden with half finger of bright white head. Moderate sweetness in the nose, along with huge notes of ripe melon. Taste is really bright. Huge notes of ripe melon (think juicy honey dew), with a balancing sweetness and bitterness. Light bodied with light carb. Very solid DIPA - defintely in the same league of Pliny. Really surprised by this offering. I don't tend to love gigantic DIPAs, and the most recent iteration of this checked in at >10%, but darned if they didn't make it work, smoothly concealing the booze with a nice mix of fruity, piney hops and apparent but not distracting malt sweetness, and an undercurrent of bitterness that never veers into hot booziness. Well done. Sarcosuchus Double IPA from Dragoon Brewing Co.